Follow along with the Unit Cards at the bottom of this article. In our previous article, we took a look at a general overview of the upcoming Night’s Watch faction for A Song of Ice and Fire: Tabletop Miniatures Game. Today, we’re continuing our look into the faction with an expanded examination of the Combat Units appearing in the Night’s Watch Starter Set. While there are technically four different Combat Units when counting Jon Snow’s loyal companion Ghost, we’re going to hold off on speaking about him until we talk more in-depth about Jon specifically, so today we have three units to discuss: Sworn Brothers, Ranger Trackers, and the Veterans of the Watch. Included in the Night’s Watch Starter Set are two units of Sworn Brothers, which form the backbone of the Night’s Watch army. As we previously discussed, the Night's Watch is a very specialized army where every unit plays a key role. This can plainly be seen when looking at the Sworn Brothers. Despite being the “basic” option for the Night's Watch forces, their stats rival those of most other army’s “elite” troops. This is because of their extremely focused and continuous "on the job" training once they arrive at the wall. Looking to their stats, we see they have a respectable 4+ Defense and 6+ Morale. While each is not overly amazing, they still form a solid line of defensive capabilities that allow the Sworn Brothers to survive a prolonged engagement. Moving on to their offensive stats, however, we see they boast an impressive 3+ To-Hit and a decent number of Attack Dice on their Greatsword. Combine this with the Sundering and Critical Blow Abilities and we see their offensive-potential begin to shine. While not overly flashy, the Sworn Brothers present a solid package of offense and defense at a mere 6 Points. Of course, like all aspect of the game, one cannot merely look at the Sworn Brothers (or any Combat Unit, for that matter) in a vacuum. Via the use of the unique Vow Tactics Cards available to the Night’s Watch the unit can be customized on the fly to fit whatever battlefield role is needed, whether it’s giving them an extra offensive punch from The Sword in the Darkness, or increasing their objective-holding capabilities and speed with The Watcher on the Wall. Whatever the situation may be, the Sworn Brothers are up to the task! Next up we take a look at the 6-Point Cavalry unit included in the Starter: The Ranger Trackers. While the unit is rather fragile, boasting a mere 5+ Defense, a savvy Commander should not have this unit engaging the enemy directly (if they can help it, of course). The Trackers fill the role of harassers in your army- sweeping along the flanks of the enemy army, shooting them from the safety of range with their Recurve Bow attack. This is easily achieved due to the Cavalry rule of the Trackers, which allow them a free Maneuver action at the start of their activation, furthering the ease in which they can reach said flanks and maximize their damage. It’s not just the mere frustration they can cause your opponent, however. With their Order: Mark Target the Trackers also supplement the raw offensive power of your entire army! By triggering this Order, which can used at the start of any friendly turn, you can make a nearby enemy Vulnerable, forcing them to re-roll any Defense Saves when they are attacked. Combine this with the -1 to their rolls they suffer from being attacked in the flank and the Trackers suddenly push out a ton of damage. Of course, any friendly unit can make use of this Vulnerable token, making the trackers a valuable support-piece as well, marking a target for your other Combat Units to Charge and destroy! Just remember to keep them out of direct combat and utilize their speed and maneuverability and they will serve you well. Finally, we come to one of the “elite” units of the Night’s Watch. Clocking in at 8 Points, we have the Veterans of the Watch- and befitting any unit of such a cost, these guys are absolutely deadly! Offensive-wise, we have an incredibly impressive 3+ To Hit combined with an 8/7/6 Attack Die profile, meaning even when reduced to their last rank these guys are always a threat. What makes the Veterans truly a foe to be reckoned with, however, are their specific set of defensive-capabilities. Featuring a staggering 3+ Defense Save combined with a 5+ Morale, there are few things, physical or mental, that can take them down. Opponents will have to utilize clever tactics and positioning to crack the iron defense of the Veterans. To top it all off, they also have the Order: Counterattack Ability, so even when your opponent does decide to try to take them down they will be punished for it as well! Of course, just like the Sworn Brothers, the threat of the Veterans increases exponentially when the Night’s Watch Vows are brought into play. Equipping the unit with The Shield of the Realms of Men, which grants them the Ability to automatically block incoming Hits, synergizes exceptionally well with their Order: Counterattack. Meanwhile, The Fire That Burns Against the Cold can likewise aid their survivability by cancelling Condition Tokens on them! So, while they might be pricy, “elite” is the name of the game when it comes to the Night Watch, and you’ll be hard-pressed to find a more fearsome unit! 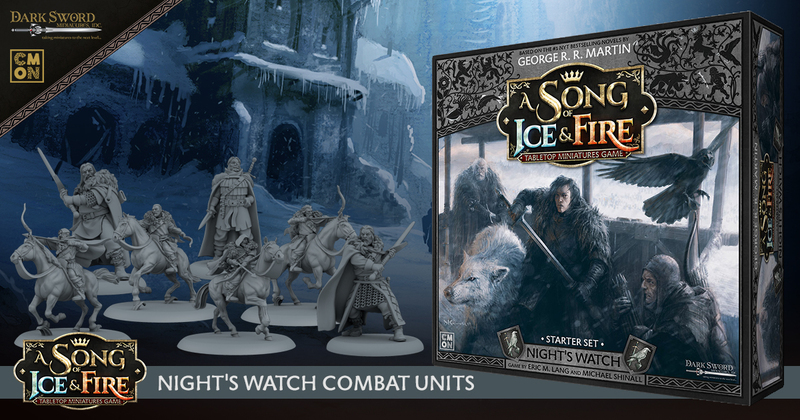 And that concludes our look at the Combat Units coming in the Night’s Watch Starter Set, which releases (Take the) Black Friday, November 23rd. Join us next time, however, as we still have some more surprises to discuss before their official release!